Seven Questions For The Dallas Cowboys’ Future. With The 2017-2018 Season Now Officially In The Books, Here Are The Questions We Have About What The Future May Hold For The Dallas Cowboys. The Dallas Cowboys will not be playing any football this weekend. Nope, their 2017-2018 season fully came to a close in 2017 after last Sunday’s thrilling 6-0 shutout of the Philadelphia Eagles at Lincoln Financial Field. Instead, the team will be watching this weekend’s opening playoff games from their couches, having finished their year with a record of 9-7, which was good enough to avoid a fourth 8-8 go under Jason Garrett, but not good enough to let them play in any games that matter. And what a lackluster win that ninth one was. After a scoreless opening three quarters coupled with 12 straight three-and-outs by both teams, this game was a great example of why people tend to tune out Week 17 match-ups. The only redeeming factor here was that fans finally got to take an extended look at rookie wide out Ryan Switzer, who started his first game of the season in this one since Cole Beasley stayed home due to injury and snagged four catches for 32 yards in the process. Since it was already clear heading into Sunday’s contest that the Cowboys were playing for a wining record and nothing more, I mostly just spent the game pondering this franchise’s future. Here are the questions still lingering in my mind as I hope that 2018-2019 will be a bounce-back one for the team and that the long run to the Cowboys’ sixth Lombardi Trophy ends sooner than later. 1. What’s gonna happen with Linehan? Team owner Jerry Jones has already said that Garrett’s job is safe heading into next season. And, if that’s the case, then you’ve got to figure defensive coordinator Rod Marinelli’s safe too, as the defense was the one side of the ball that impressed this year for the Cowboys. But what about offensive coordinator Scott Linehan? Jones seems to think Linehan’s got a future here still, but should he? Steelers offensive coordinator Todd Haley is going through something at the moment, but that could simply mean that the architect of one of the most exciting offenses in the NFL could be available. Don’t forget: During the Bill Parcells era, Haley was the Cowboys’ receivers coach. 2. Why can’t this team play up to its ability level? I still think the talent is where it needs to be, and that this year’s 9-7 record doesn’t line up with where this team should be performing. Obviously, off-the-field distractions and suspensions played a major part in changing the look of the Cowboys this year, with headlines of Ezekiel Elliott’s suspension loomed over the entire organization for the whole season. And when Zeke inevitably had to serve his six-game suspension? It unfortunately came up just as Dak Prescott began to regress even more than he already had earlier on in the year. 3. 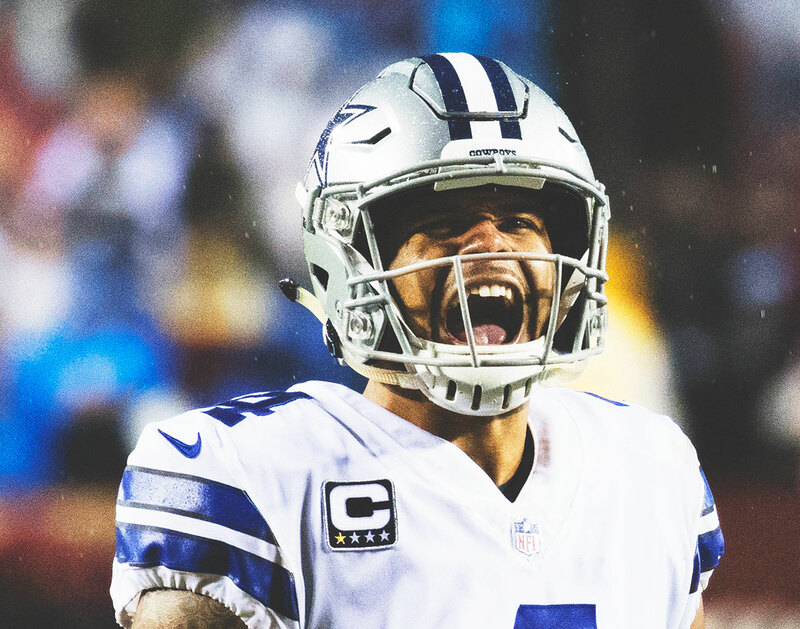 Was this season just a sophomore slump from Dak or something worse? Dude more than tripled his interception total from last season to 13. Worse, his connection with Dez Bryant and the rest of the receiving corps was just off this year — despite what the Dez-focused headlines read, all wide receiver numbers were down this season. Terrance Williams had zero touchdowns on the year! Is it fair that it was Dez who most often had his talents questioned? He still topped this team in receiving yards — even with Dak not getting him the ball as often as he should’ve. It’s time we seriously wondered if we’re all giving Dak too much of a pass. Everyone was quick to scapegoat Zeke for his off-field troubles hurting the team and praise Dak for all his off-season training and studying — but did any of that extra effort on his part actually show? Meanwhile, Zeke still almost got his second straight 1,000-yard rushing season despite missing six games due to suspension, coming up short by just 17 measly yards, and still finishing in the top 10 for running back rushing yards across the NFL this year. Now that his suspension’s been served, maybe it’s time we stopped pointing our fingers Zeke’s way and turned them toward Dak. 4. Where can the defense go from here? Obviously, the team’s defensive play was the big surprise of the season. While by no means as dominant as the “doomsday” defenses of previous Cowboys teams, this unit showed all sorts of promise and growth. Demarcus Lawrence had a monster season with 14.5 sacks — something no Cowboy has done since DeMarcus Ware still wore the blue star on his helmet. And while the team didn’t quite reach its goal of 30 turnovers, it did pretty well, snagging 10 interceptions and forcing 10 fumbles. The young secondary was the catalyst for a lot of that, with rookies Chidobe Awuzie, Jourdan Lewis and Xavier Woods each making big plays in many games. Along with Jeff Heath and Kavon Frazier, this young secondary has all the makings of becoming an unstoppable force one day down the line. What does the future hold for the linebackers, though? Are we sold on Jaylon Smith? I mean, the guy returned from a terrible injury and has showed progress — but he’s still not 100 percent. Is he Sean Lee’s successor? Does Lee need one? Probably — he’s a beast when healthy, but he’s never completed an entire 16-game season, he’ll be 32 years old at the start of next season and he’s not getting any younger. 5. How long can Jason Witten keep going? He’s had an amazing career, but he’ll be 36 heading into next season. Preseason star Rico Gathers had us feeling comfortable that the tight end position may be in good hands down the line — but then he went down with a career-threatening injury and hasn’t been seen since. James Hanna and Jeff Swaim aren’t the answers. Or, I dunno, are they? We never see them, either. 6. What does off-season free agency hold for this team? Jerry Jones has been stingy with his wallet in recent years, but there is a bunch of good free agent talent to choose from at skilled positions this off-season. Possibly bringing in a receiver like Josh Gordon or Jarvis Landry could be a huge help for the passing game, giving Dak more options and lighting the coverage on Dez. Speaking of free agents: The organization will also be busy finding a way to keep its own talent on board as defensive studs Lawrence, David Irving and Anthony Hitchens — all key cogs and difference-makers on the defensive side of the ball — are in need of new contracts. 7. What’s it going to be like when the Cowboys host the NFL Draft for the first time ever? The NFL will descend upon Arlington on April 26, 27 and 28 this year as AT&T Stadium hosts the draft. That’s probably going to be really fun, actually. If nothing else, at least we have that to look forward to. Dak Prescott cover photo by Keith Allison via WikiCommons. Previous ArticleSongs Of The Week: Luna Luna, Mind Spiders & More.